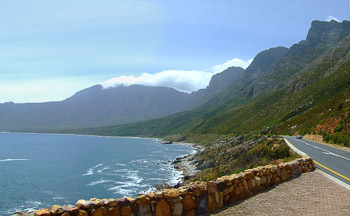 The beautiful Cape region is indeed a unique experience. 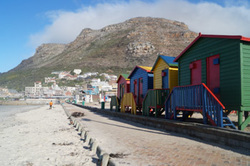 Cape Town, also known as the Mother City, is the world's most beautiful city and home to many attractions well worth visiting. 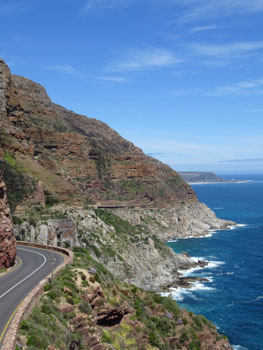 What's more, after only an hours drive you can find yourself in beautiful vineyards, the world's best place to see whales from land and the Cape of Good Hope. 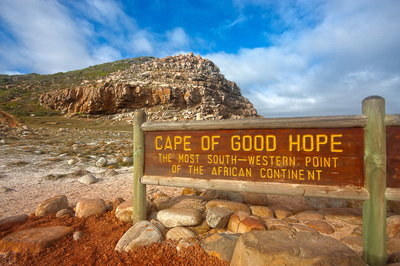 Explore Cape Point Tour and see the Cape of Good Hope, penguins and more! Go shark cage diving and see the great white shark up close! 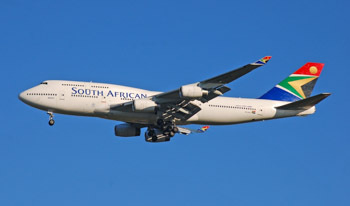 Today you will arrive at Cape Town International Airport and make your way to your accommodation for the next few nights. 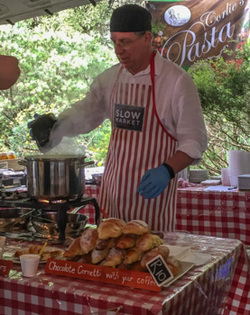 Depending on your time of arrival, more activities can be planned for this afternoon or you may prefer to simply relax at your comfortable guesthouse. 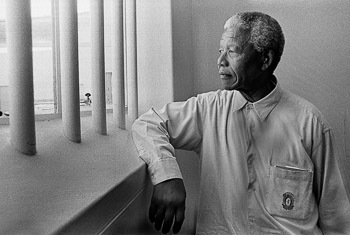 What about visiting Robben Island today, the famous island where Nelson Mandela was imprisoned for many years? Here you will go on an extensive tour of the prison and learn about what happened during those years. 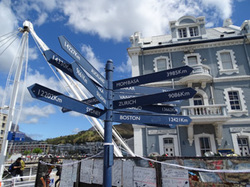 In 1997 a museum was built and the entire island is declared as a UNESCO Cultural World Heritage Site. This iconic place is well worth a visit. 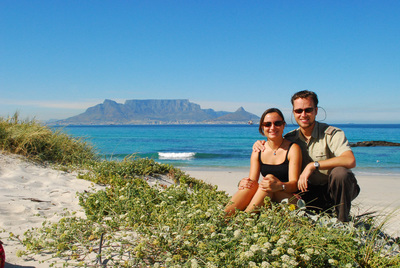 Ascend Table Mountain, the choice is yours as to whether you walk to the top or catch a cable car up. Once at the top of the mountain, expect to want to spend a few hours walking around while enjoying the natural surroundings and taking in the magnificent views. 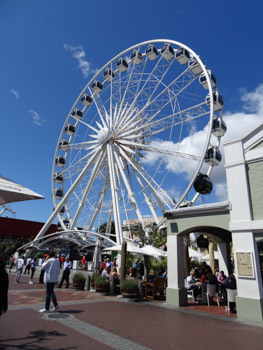 Afterwards, you will visit the V & A Waterfront. 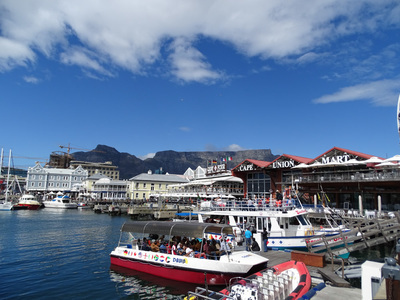 Here you can enjoy the bustle of the harbour and shops, visit the Two Oceans Aquarium, or treat yourself to a delicious lunch at one of the many terraces or fish restaurants. Discover the Cape of Good Hope today on a stunning tour that includes the following must-see destinations: Muizenberg, Simon’s Town (with the penguins), Noordhoek, Hout Bay, and Cape Point (with time for a walk in Table Mountain National Park). 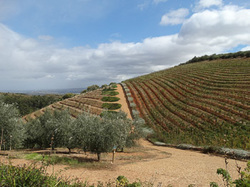 If you are a wine lover, a visit to the Klein Constantia Wine Farms should also be considered. Try the absolutely delicious, world-renowned ‘Vin de Constance’. 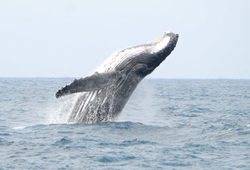 Every year between June and November, whales migrate along the South African coast so why not take a trip and see them on their journey? 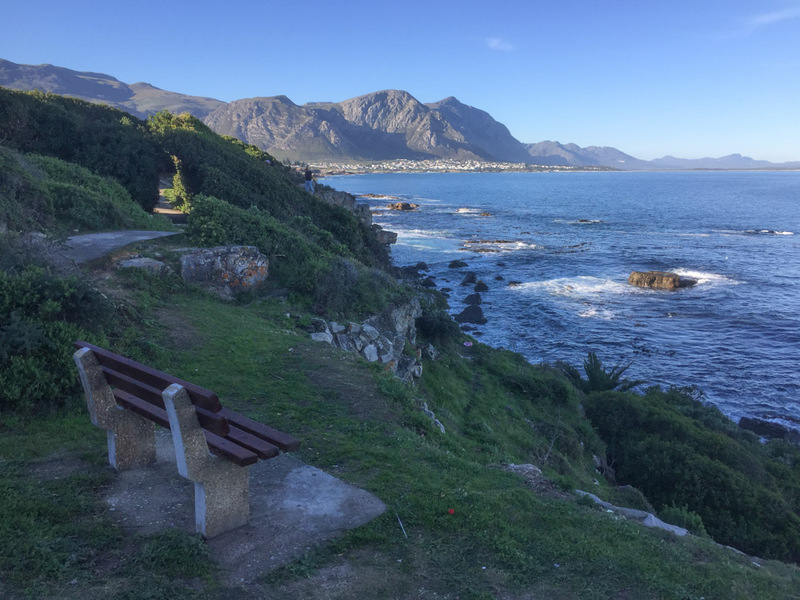 Hermanus, a popular tourist destination just over an hours drive from Somerset West, is known as the best place in the world for land-based whale watching. 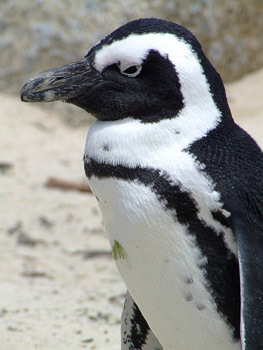 This reputation has been well earnt, with the bay renowned for providing sightings of these magnificent animals passing by as close as 10 metres to the shore! Look out for their impressive acrobatics as they breach the water! 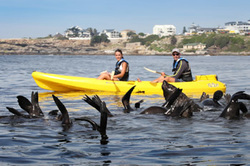 Sea kayaking or boat-based whale watching tours are also an option here. A short drive away is Gansbaai, where the brave can experience another large marine animal, the Great White Shark, shark cage diving! In the evening you'll go back to Cape Town airport, from where you’ll fly home. If the weather does not allow a particular activity to go ahead there are a number of attractive indoor options to enjoy in the Cape. One example is the Two Oceans Aquarium (http://www.aquarium.co.za) where you can easily spend a half, or even a full day. Located near the V&A Waterfront, which in itself is also great to visit on a rainy day, the Aquarium is easily combined with a visit to the bustling shopping district. Erinvale Golf Club, nestled at the foot of the Helderberg and Hottentots Holland mountains, is one of South Africa's best golf challenges. Located in the beautiful wine region, Erinvale's breathtaking views of the mountains and the sea are an important part of an unforgettable golfing experience. This 5km, white sandy beach is a popular destination and is safe to swim or simply to sit and enjoy. 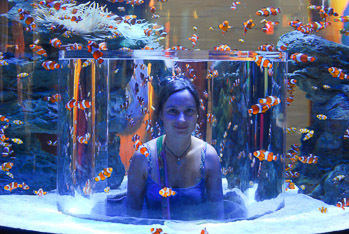 The nearby amusement park, with water slides, mini golf and swimming pool, is an attraction in itself. Note: Take note though: The sea around the Cape is cold (± 15 degrees). 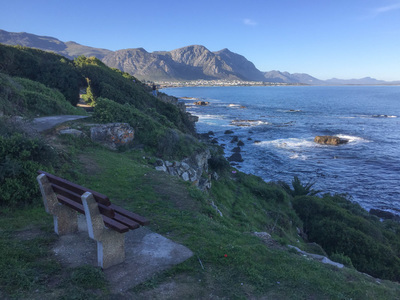 Even the seasons are reversed in South Africa, so it's the middle of winter in June-July with temperatures around 5-20 degrees, depending on the weather. City tour on the hop-on, hop-off bus. If you feel like embarking on a two hour, hop-on, hop-off bus ride around the city of Cape Town, your guide will drop you off at the Two Oceans Aquarium. With a series of 18 stops, you will see a lot during these two hours. 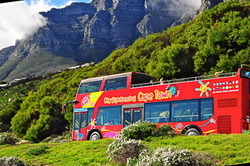 Stops on the bus route include: The Clock Tower, Cape Town International Convention Centre, Cape Town Tourism, St. George's Cathedral, South African Museum, Mount Nelson Hotel, SA Jewish Museum, District Six Museum, The Castle of Good Hope, Gold Museum, Jewel Africa, Table Mountain Cableway, Camps Bay, 44 President Hotel, Sea Point, Winchester Mansions, Green Point Lighthouse. An audio system, available in a number of languages, narrates the tour and you will learn interesting facts about each stop. 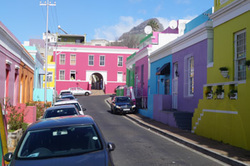 Maybe not the first thing you would think of when your planning your tour to Cape Town, but the heart transplant museum is one of a kind and celebrates the first ever heart transplant performed in the very building in 1967! A few hours at this interesting museum would be a few hours well spent! 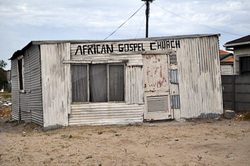 The Camissa township gospel tour is an impressive and special experience. Here a local guide takes you through the township on the outskirts of Cape Town and on Sundays you also get to take a look at a local church where the gospel choir practices. 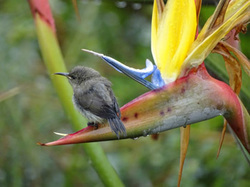 Previous guests of Tailor Made Safaris wholeheartedly recommend this tour! Your host will be more than happy to book this tour for you. These costs cannot be paid by us and therefore will be charged on your credit card by AVIS. AVIS also requires a refundable rental deposit (between ZAR 3500-4000). This sum will be taken off your credit card at the beginning of your trip and if all is well it will be deposited back into your account at the end. For renting a vehicle the driver must be over 18 years old and must have had a valid drivers licence for over a year, which must be valid for at least a year at the start of the rental period, and a valid passport and credit card. Please note that without a credit card, you cannot rent a car! Fully guided option available on request, please enquire to info@tailormadesafaris.co.za.